Welcome back to the SAP S/4HANA Cloud use case series. After understanding the relevant dimensions and value levers in the last few blogs, we will illustrate the first use case today. In this blog, we will highlight machine learning with SAP S/4HANA Cloud in conjunction with the SAP Clea for Cash Application. To start from the beginning, let me define the concept of machine learning. Machine learning is the practice of teaching a computer how to spot patterns and make connections by showing it a massive volume of data. Rather than programming software to accomplish a specific task, the machine uses big data and sophisticated algorithms to learn how to perform the task itself. Machine learning allows applications to “think” and independently make a determination or prediction – going beyond what predictive analytics and big data analytics can do, and often beyond what humans can do. Examples of the use of this form of machine learning in today’s consumer-centric world include the recommendation engines built into Amazon and Netflix services, and the facial recognition capabilities of Facebook. However, is machine learning also relevant in finance functionality? Yes, definitely! 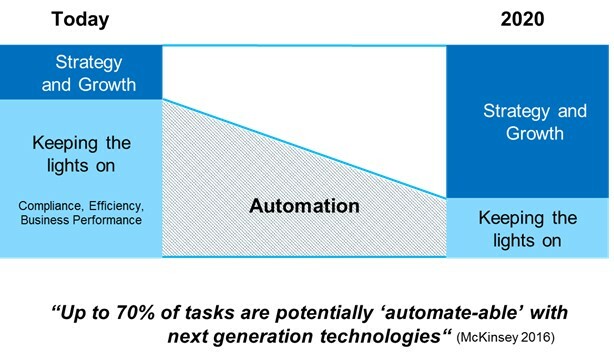 According to a study by McKinsey in 2016, it can help to widely automate tasks in the areas of compliance, efficiency and business performance that currently make up to 70% of the efforts. SAP S/4HANA Cloud is the brand new ERP entry offering based on SAP HANA technology. With it, customers can start their journey to the digital core in the public cloud with a simple, easy-to-use and modern finance solution. It includes selected procurement and order management capabilities to help customers run end-to-end finance related activities. SAP S/4HANA Cloud is built as the center of a modular cloud suite, with core finance capabilities like accounts payable, accounts receivable, credit management, bank account management and more. In the finance area of SAP S/4HANA Cloud, and more specifically in the area of accounts receivables, incoming payments are ideally matched automatically to open receivables such as invoices. Any manual post-processing of incoming payments that could not be matched to open invoices takes time and effort. SAP Clea for Cash Application enables you to match open receivables to incoming payments using machine learning. By using machine learning procedures to train financial applications to learn from manual matchings, SAP Clea for Cash Application achieves higher automatic matching rates. The integration to the SAP Cash Application solution helps automate the invoice-matching process and provide the prediction results back to SAP S/4HANA Cloud with the help of machine learning. SAP Clea for Cash Application is a cloud service that integrates with S/4HANA Cloud. The historical clearing information coming from SAP S/4HANA Cloud is sent to the SAP Clea for Cash Application to train the model and derive matching criteria. Training can be scheduled regularly to ensure changing behavior is captured so that the model can adapt. When new bank statements are received, cases not handled by the standard clearing rules will be sent to the cash application service along with the open receivables so the machine learning model can infer matching proposals. Proposals are returned to SAP S/4HANA Cloud and those that meet the configurable confidence threshold are automatically cleared for full automation. 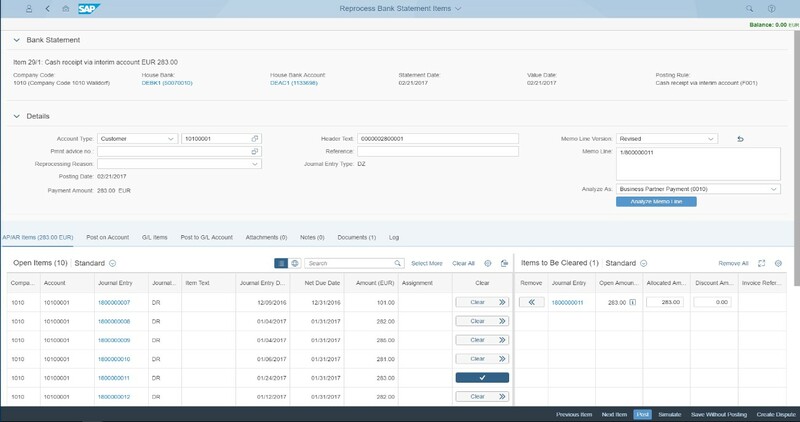 When there are multiple proposals for a payment, they are presented to the AR accountant within the SAP “Reprocess Bank Statement Items” Fiori app in use today. With this SAP S/4HANA Cloud app, you can reprocess bank statement items that were not processed automatically. Bank statements can be entered into the system automatically (electronic bank statement) or manually. In both cases, rule-based processing assigns and clears the payments automatically. If the automatic processing is not successful, manual reprocessing is required. In this SAP Fiori app, you can reprocess a bank statement item, mark it as reprocessed, and enter a reason for reprocessing. You can also add attachments to bank statement items. If we now take a look at the value levers efficiency, effectiveness and agility, and map this use case to them, you will realize that specifically “increase efficiency” is most relevant here. The clearing of bank statements with receivables is either fully automatized with no human intervention or the manual execution is accelerated drastically by giving the AR staff a few clearing proposals, so that they can decide within seconds for the right one. Indirectly this has a positive impact on effectiveness by freeing up time to raise process intelligence and speed up signal to action. Stay tuned for the next use case, in which we will examine a Two Tier ERP use case and map it against the value levers and dimensions. It would be nice if the screenshot would enlarge on click. I’m interested in the UI and cannot read any of the text, let alone see where / how machine learning is integrated. Thanks.